For other uses, see Levis (disambiguation). 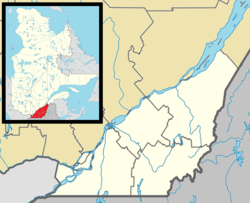 Lévis is a city in eastern Quebec, Canada, located on the south shore of the St. Lawrence River, opposite Quebec City. A ferry links Old Quebec with Old Lévis, and two bridges, the Quebec and the Pierre Laporte, connect western Lévis with Quebec City. The population in July 2017 was 144,147. Its current incarnation was founded on January 1, 2002, as the result of a merger among ten cities, including the older city of Lévis founded in 1861. Lévis is also the name of a territory equivalent to a regional county municipality (TE) and census division (CD) of Quebec, coextensive with the city of Lévis. Its geographical code is 25 as a census division, and 251 as an RCM-equivalent territory. First Nations people are said to have favoured the Pointe-Lévy (currently named Lévis) area long before French settlement due to its ideal location, at the junction of the St-Lawrence and the Chaudière rivers. Many archeological sites reveal evidence of human occupation for about 10,000 years. Some historians theorize that Pointe-Lévy could have been one of the main centres of Native American population development in the Quebec province. In 1636, approximately 28 years after the foundation of Quebec City, The seignory of Lauzon was founded on the eastern part of the actual territory. In the following years, other seignories were founded near the St-Lawrence River. Pointe-Lévy was mainly an agricultural domain in which several land-owners ("Seigneurs") controlled their part of land in a medieval feudal system. The land of the Lauzon seignory remained unoccupied until 1647, when Guillaume Couture became the first European settler installed in front of Quebec City. Couture was at that time, the first Administrator, Chief Magistrate, Captain of the Militia, member of the Sovereign Council and was widely considered a hero in New France. Couture, however, was not the first 'Seigneur' of the Lauzon Seignory, as the land had been previously owned by Jean de Lauson (French Governor between 1651 and 1657). During the Seven Years' War in the summer of 1759, General James Wolfe established a camp in the territory of Pointe-Lévy and laid siege to Quebec City. The siege succeeded and after firing cannons from the hills of Pointe-Lévy for three months and the battle on the Plains of Abraham in front of the walls, Quebec fell to the British. During this time, Pointe-Lévy served as the main encampment of the British army in the Quebec area. The constant cannon firing between Quebec City and Pointe-Lévy served to repel both French and British ships from advancing further up the St. Lawrence, thus preventing the delivery of reinforcements to other major cities like Montréal. In 1763, Marie-Josephte Corriveau, "la Corriveau", was hanged in Quebec City for murdering her husband with a pitch-fork. In accordance with English practice, her body was displayed in a cage for several weeks in St-Joseph-de-la-Pointe-Lévy (old part of the former City of Lauzon). Used for the first time by the British government in North America, this was an unusual punishment reserved for persons found guilty of particularly heinous crimes. This punishment was practised in England since the Middle Ages. From 1854, the railroad appeared in Pointe-Lévy making the city a major transportation centre for commerce and immigration. Being on the south shore of the St. Lawrence River, Pointe-Levy could be connected by rail to Ontario, Maine (and from there the whole United States) and the Maritime Provinces. Between 1865 and 1872, the British constructed three forts in order to protect the City of Quebec and its surroundings, from the looming threat of an American invasion. Those garrisons never had to serve their intended purpose. One of them, Fort-Chambly, still stands to this day and is open to the public. The City of Lévis, named after the successor to Montcalm, the Chevalier de Levis, was erected in 1861. The founder of this new city was Mgr. Joseph-David Déziel (1806–1882). Many municipalities in the territory of present-day Lévis were merged between 1861 and 2002. Many towns were created and the Village of Pointe-Levy (or St-Joseph-de-la-Pointe-Lévy) became the Village of Lauzon in 1867 and then the City of Lauzon in 1910. In the late 19th and beginning of the 20th century, Alphonse Desjardins, pioneered the foundation of the credit union movement and founded the first caisse populaire in Lévis. He also began a long process to create what later became the Desjardins Group by travelling everywhere in Quebec helping people in other cities to start their own credit union. On 28 June 1985 Canada Post issued "Fort No.1, Point Levis, Que." one of 20 stamps in the "Forts Across Canada Series" (1983 and 1985). The stamps are perforated 12½ x 13 and were printed by Ashton-Potter Limited based on the designs by Rolf P. Harder. Lévis covers an area of 444 km2 (171 sq mi): 10% urban, 48% farmlands, 36% forests and 6% wetlands. In addition to the Saint Lawrence River, the Etchemin and Chaudière rivers also run through the city before ending their journey into the Saint Lawrence. The Chaudière River also boasts a waterfall with a suspended bridge, which can be accessed from Autoroute 73. Lévis County existed until January 1982 when it was divided into Desjardins Regional County Municipality and Les Chutes-de-la-Chaudière Regional County Municipality. On January 1, 2002, ten cities were merged by the Quebec provincial government to form the new city of Lévis. Previously, the former cities of Lauzon and Saint-David-de-l'Auberivière had been merged to Lévis in 1989. The regional county municipalities of which these cities were a part ceased to exist. The new city was divided into three arrondissements or boroughs. Desjardins, Les Chutes-de-la-Chaudière-Ouest and Les Chutes-de-la-Chaudière-Est, which correspond to most of the territory of the former RCMs (however, Saint-Henri and Saint-Lambert-de-Lauzon remained independent and did not amalgamate into Lévis). The ten former municipalities are today districts (secteurs) within the city; each of the three boroughs is composed of either three or four districts. The pre-2002 Lévis had already merged with Lauzon and Saint-David-de-l'Auberivière in 1989. The city of Lévis' population grew by an estimated 1.3 per cent in 5 years. Lévis is an old community in terms of population as the proportion of youths is lower than the national average and the proportion of those over 65 years of age is higher than the national average. Some 14.5 per cent is under 14 years of age, while those over 65 number 15.7 per cent. The city is one of the most homogeneous in Canada: around 99 per cent of the population are of European ancestry, while over 97% of residents speak French as their mother tongue. Although a relatively small city, Lévis is not a typical suburb. The presence of several large employers has allowed many citizens to both live and work in Lévis. It is home to the Ultramar refinery, one of the largest in eastern Canada, Frito-Lay and Davie Shipbuilding are located in the borough of Lauzon (former city). The Desjardins Group, as well as its subsidiary Desjardins Financial Security, are headquartered in the city. The founder, Alphonse Desjardins, lived in Lévis and, with his wife, Dorimène Roy Desjardins, ran the first Caisse Populaire (similar to a credit union) from their home. The city is also a major agricultural business research & development centre. More and more high technology companies, such as Creaform (3D), are established in Lévis. Lévis is home to the enclosed regional shopping mall Les Galeries Chagnon which has 106 stores. Many small business and entertainment developed in the city during the last decade and finalized the transformation from a Quebec City suburb into a small city. Commission scolaire des Navigateurs operates Francophone public schools. There are many schools of different levels, including the Cégep de Lévis-Lauzon and a UQAR campus (Université du Québec à Rimouski). ^ a b c "2011 Community Profiles". 2011 Canadian Census. Statistics Canada. July 5, 2013. Retrieved 2014-04-17. ^ "Quebec statistics" (in French). 2.statcan.ca. 2009-12-10. Retrieved 2012-01-02. ^ Lévis at The Canadian Encyclopedia. ^ "2006 Community Profiles". 2006 Canadian Census. Statistics Canada. March 30, 2011. Retrieved 2014-04-17. ^ "Évolution démographique des 10 principales villes du Québec (sur la base de 2006) selon leur limites territoriales actuelles1, Recensements du Canada de 1871 à 2006" (in French). Institut de la statistique du Québec. 2008-02-01. Archived from the original on 2013-10-06. Retrieved 2012-02-08. ^ These figures correspond to the territory of the city of Lévis following the municipal reorganizations of 2002 and 2006.